Snow brings powder to the ski slopes but long-term winter forecast calls for a shift back to a warmer and drier than normal winter. Even with the recent snowstorms, it is far too soon to know with any certainty whether there will be an ample water supply in 2019. Cool December storms have dramatically boosted the once-meager Washington snowpack, easing concerns of water shortages in 2019 and bringing welcome powder for skiers taking to the slopes during the holiday season. 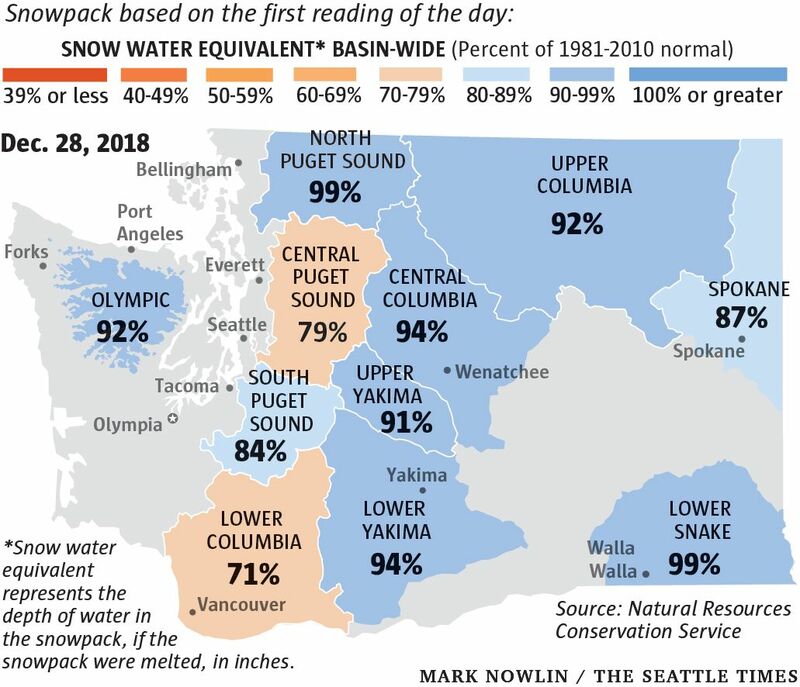 The statewide snowpack, as of Friday, averaged 89 percent of normal compared to just 38 percent of normal Dec. 7, according to state Department of Ecology officials. Though Saturday briefly brought warmer weather, the temperatures are forecast to fall, and the snowpack deepen, this week as low-pressure systems blow in from the Pacific. “We have this tremendous improvement in our conditions. We are in pretty good shape,” said Jeff Marti, drought coordinator at the Ecology Department. 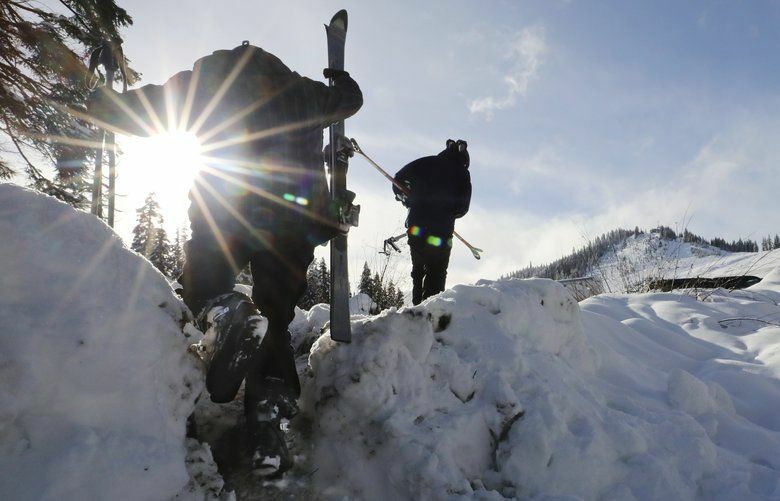 The state’s mountain snowpack is a key, closely tracked — and sometimes fickle — resource. The snow stores water that sustains forests and provides summer stream flows for salmon and other fish. Humans rely on it for all kinds of things, including hydroelectricity and irrigation in the prime orchard and farm lands of the Yakima basin. 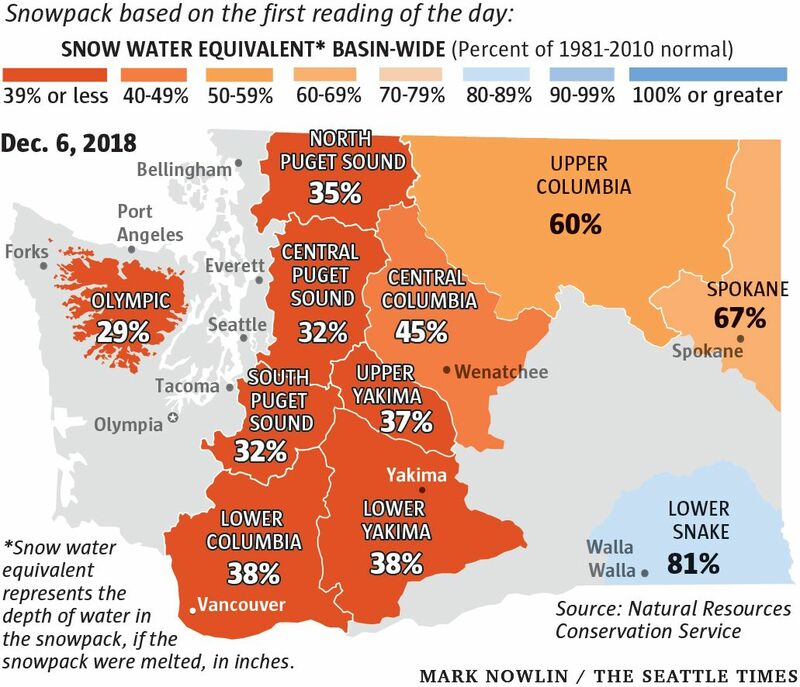 In the decades ahead, as temperatures are forecast to warm because of the build up of greenhouse-gas emissions from fossil fuels, climate scientists expect the average snowpack to decline as more precipitation falls as rain across Washington’s mountain ranges. Statewide snowpack earlier in the month was less than 40 percent of normal in many locations — but has since rebounded amid late December storms and now is close to normal for the date of Dec. 26. This fall, the buildup of the annual snowpack fell behind pace during a November that was warmer, as well as drier, than normal across most of the state. At the end of the month, two days of storms on Nov. 27 and 28 brought more than 3 inches of rain to Seattle-Tacoma International Airport. But this was a “warm event with high freezing levels and thus not beneficial for mountain snow,” according to a monthly report from the Office of the Washington State Climatologist. The first week of December, in terms of snowpack, also was a bust. As late as Dec. 9, berry bushes still poked out of the slopes at the Mount Baker Ski Area. Then the weather shifted, enabling the ski area to open Dec. 12, and by last Thursday, 187 inches of snow had fallen on the slopes. There also has been some wild weather, with winds gusting at one point up to 119 mph. 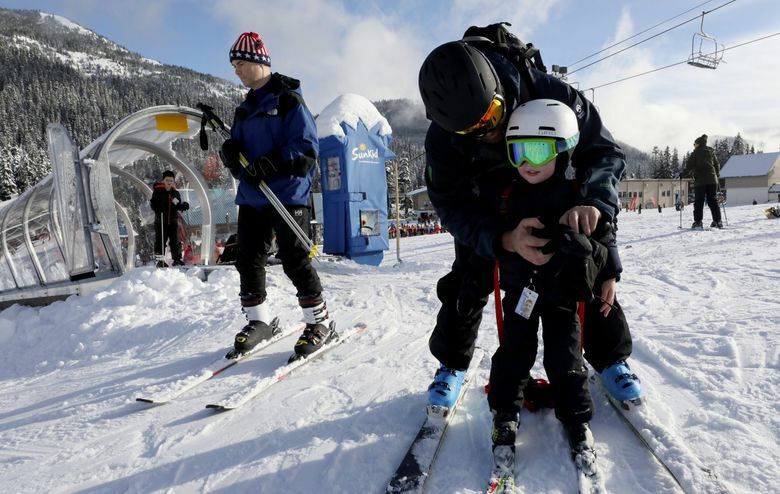 “We’ve had a season’s worth of weather in two weeks,” said Gwyn Howat, executive vice president of the Mount Baker Ski Area, who said the cooler temperatures brought “spectacular powder” from the storms cycling through the mountains. Crystal Mountain, southeast of Enumclaw, was able to open some lifts to skiers the day after Thanksgiving with the help of $5 million in snow-making equipment the resort bought this past summer. 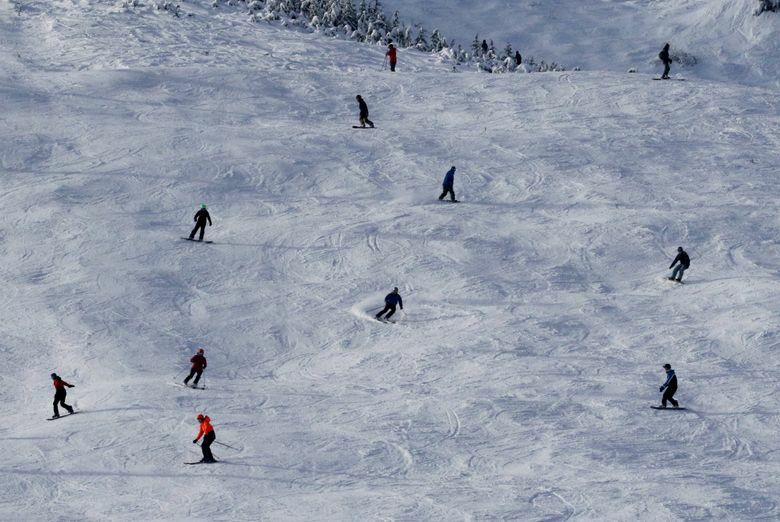 Natural snow from December storms allowed the resort to open all of its terrain, and that has kept lift lines short even during the peak post-Christmas week, according to Tiana Anderson, director of sales and marketing at Crystal Mountain. “People are spread out all over the mountain, and the longest wait time has been about five minutes,” Anderson said Thursday. Even with the recent snowstorms, it is far too soon to know with any certainty whether there will be an ample water supply in 2019. A lot depends on what happens through the winter and early spring. And looking ahead, the long-term outlook through March from the state climatologist’s office calls for warmer than normal temperatures, and below-average precipitation. So it’s unclear if the snowpack will continue to build at an average pace. Notes Marti, the state drought coordinator: The long term forecasts aren’t always right. “This is one of the years when you hope they are wrong,” Marti said.